I don’t know about you guys, but we had the most wonderful weekend ever this Memorial Day. Hubby returned from China after a week and a half, and we went straight from the airport at 10 pm Up North to our cabin. The weather was incredible. Sunshine, warm temperatures, and no rain. Despite the lovely conditions, we seem to have embarked upon the most outrageous mosquito season I can remember. They’re out in swarms, and it’s every man for himself. If you’ve never grilled pizza before, don’t feel intimidated. 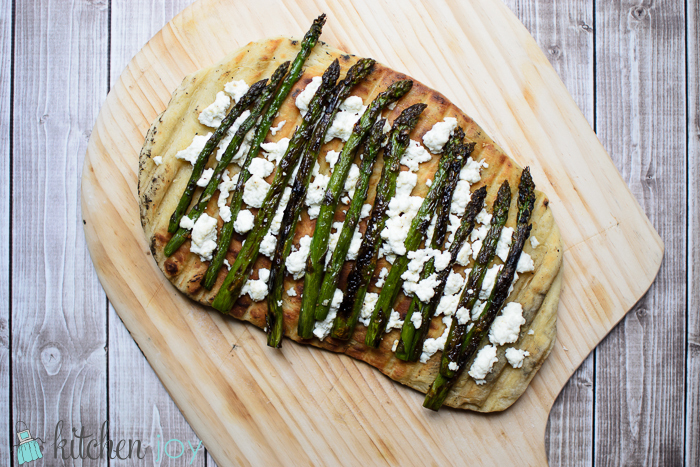 You can read all about how I like to grill pizzas in this Grilled Pizza post. For planning purposes, if this is your first time grilling a pizza you may want to make up an extra batch of dough just in case you burn your crust on your first try. Pour yourself a glass of cold lemonade, douse yourself in bug spray, and get grilling! Most importantly, have fun! Heat enough charcoal to fill one half of your grill. Arrange heated charcoal on one side of the grill. Toss trimmed asparagus in some olive oil and season with salt and pepper. Grill until tender when pricked with a fork, about 6-8 minutes. Remove to a plate and set aside. On a large baking sheet or pizza peel, spread one ball of dough into desired shape and thickness. Brush surface of dough with olive oil. Lay dough on grill grates over indirect heat, oiled side down. Allow to cook for 3 minutes or so before disturbing the dough. Lift edges with tongs or spatula to check the color. Rotate if needed. While the first side of the dough is cooking, brush the other side with olive oil. Once the crust has turned a nice golden brown with dark grill lines, carefully flip the dough over and grill the second side (that you just brushed with oil). 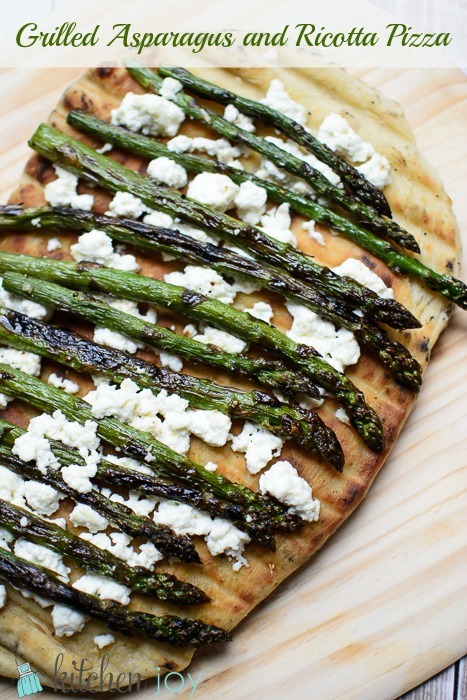 Brush half of the Garlic/Herb Olive oil over the surface of the crust, then top with half of the Ricotta, followed by half of the grilled Asparagus. Place cover on the grill for a few minutes to help the cheese to melt/heat through, checking crust frequently. Carefully remove pizza to a pizza peel or large baking sheet. Re-heating tip: For best results, reheat leftover pizza in a skillet on the stove or on a piece of aluminum foil in a 350 degree oven for about 5-7 minutes until heated through. These methods retain the crispiness of the crust instead of the soggy crust that you get when reheating pizza in a microwave.